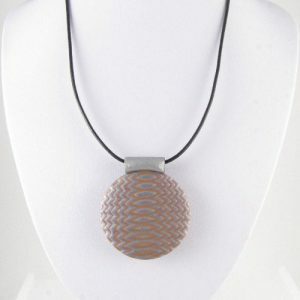 Here you can find jewellery made with polymer clay using the Mokume Gane technique. 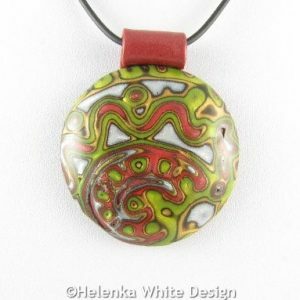 Handcrafted Mokume Gane polymer clay pendant on a silver plated chain. 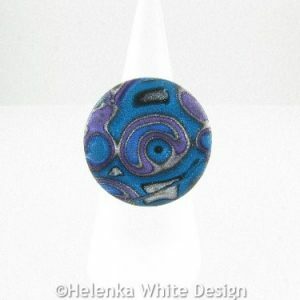 Large domed Mokume Gane pendant in blue – handcrafted with polymer clay in blue, silver, black, purple and turquoise. The pendant hangs on a silver plated chain, which closes with a lobster clasp. 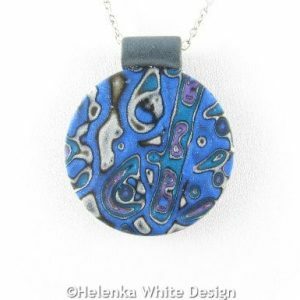 Mokume Gane pendant in blue – handcrafted with polymer clay in blue, silver, black, purple and turquoise. The pendant hangs on a silver plated chain, which closes with a lobster clasp. 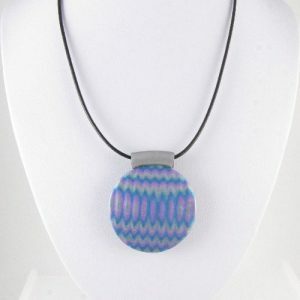 Mokume Gane pendant – handcrafted with turquoise, silver and purple polymer clay. 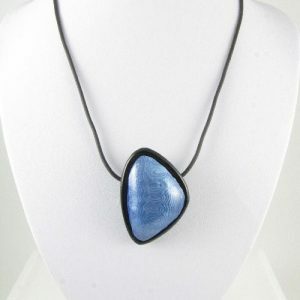 The pendant hangs on a leather cord, which closes with a lobster clasp. 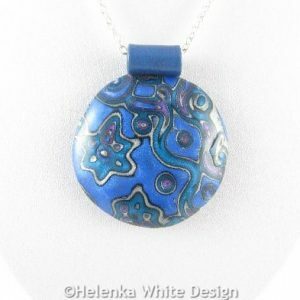 Mokume Gane pendant – handcrafted with silver, copper and blue polymer clay. 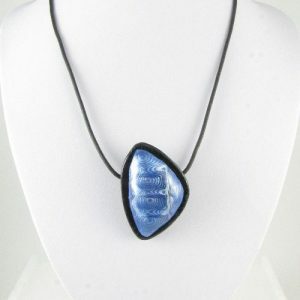 The pendant hangs on a leather cord, which closes with a lobster clasp. 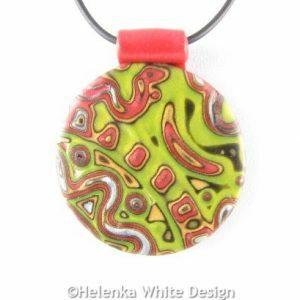 Large domed Mokume Gane pendant – handcrafted with polymer clay in green, red, silver, gold and black, The pendant hangs on a black buna cord, which closes with a lobster clasp. 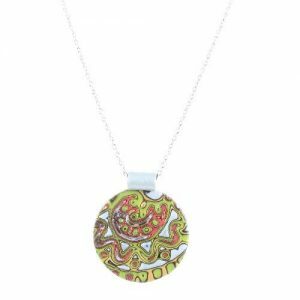 Oval Mokume Gane pendant – handcrafted with polymer clay in green, red, silver, gold and black, The pendant hangs on a black buna cord, which closes with a lobster clasp. 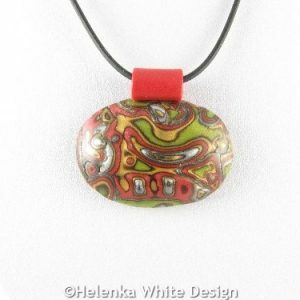 Mokume Gane pendant – handcrafted with polymer clay in red, silver, gold and black, The pendant hangs on a black buna cord, which closes with a lobster clasp. 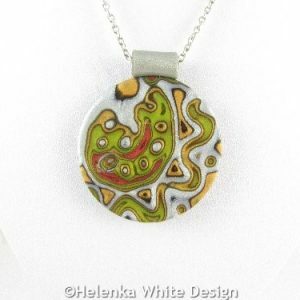 Mokume Gane pendant with snake – handcrafted with polymer clay in green, silver, gold, black and red. 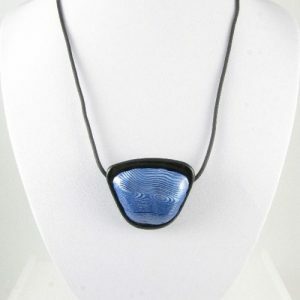 The pendant hangs on a black buna cord, which closes with a lobster clasp. 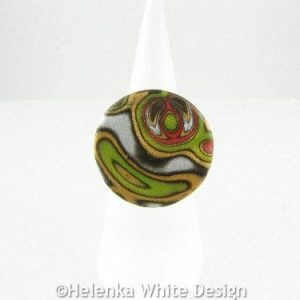 Mokume Gane pendant – handcrafted with polymer clay in green, silver, black and red. 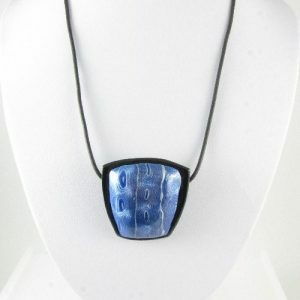 The pendant hangs on a silver plated chain, which closes with a lobster clasp. Copper and blue cat pendant – handcrafted with polymer clay in copper, blue and silver. The pendant hangs on a bronze gold chain, which closes with a gold bronze lobster clasp. 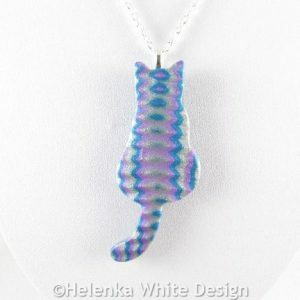 Blue and silver cat pendant – handcrafted with polymer clay in blue, silver and purple. The pendant hangs on a silver plated chain, which closes with a silver plated lobster clasp. 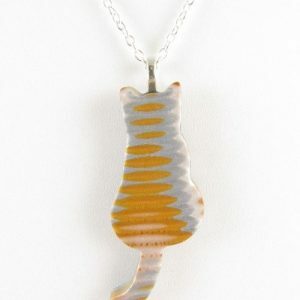 Gold and silver cat pendant – handcrafted with polymer clay in gold, silver and pearl. The pendant hangs on a silver plated chain, which closes with a silver plated lobster clasp.